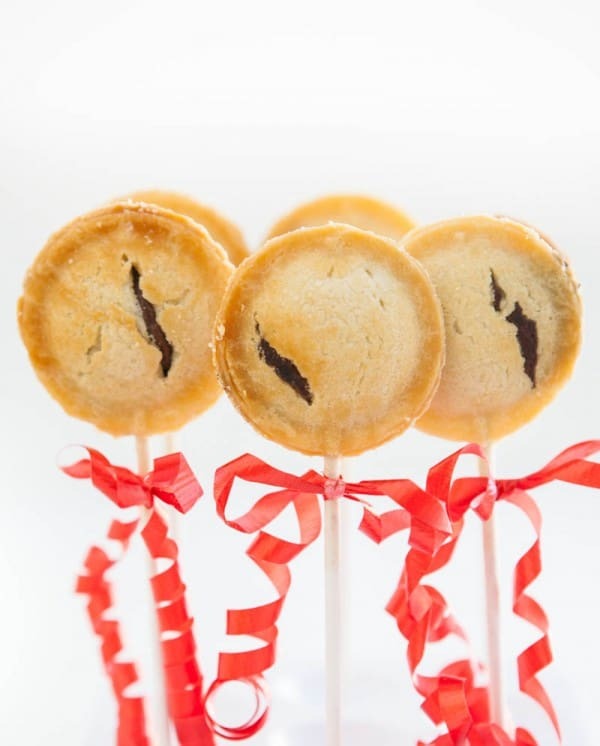 Cake pops may be cute, but the pie pop has my heart. That tender flaky crust wrapped around just a taste of the most decadent filling, it’s just to die for. I’ve made pie pops in several different shapes and with lots of different fillings. But I’ve got to say that this brownie pie pop just might be my new favorite. 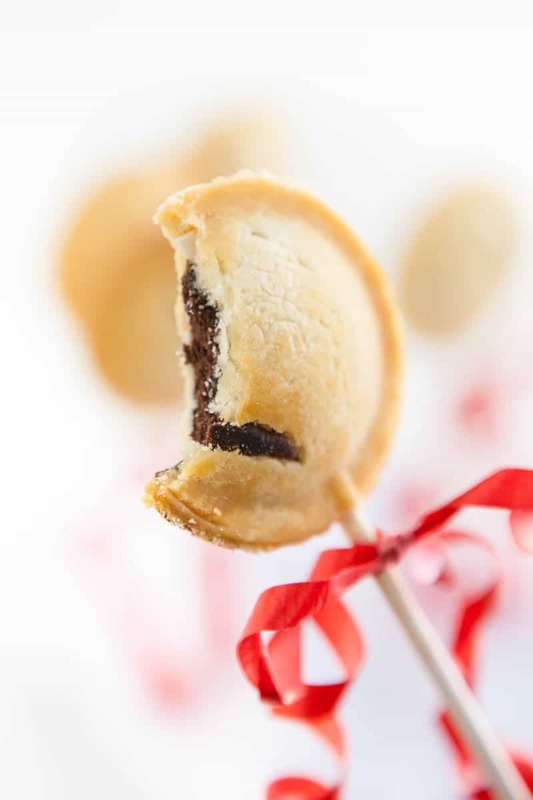 It’s the most tender flaky pie crust wrapped around a dense, fudgy, flourless brownie, on a stick! I made these with my new Baby Cakes Pie Pop Maker. It was a fun way to make these pie pops, and they only took about 10 minutes! The pie pop maker made them crack a little, but I love that you can see a peak of the filling inside. You can also make these in the oven on a cookie sheet that has been lined with parchment paper in a 425° oven for about 10 – 15 minutes. You can add bows to decorate your pie pops, and even wrap them in cellophane sleeves with bows to give as gifts. Need help with the Crisco Pie crust recipe this holiday season? The pie experts from Crisco are here to help. The Crisco Pie Hotline 1-877-FOR PIE TIPS (877-367-7438) is back to offer around-the-clock pie baking help this holiday season. From how to avoid shrinking crusts to creating the perfect filling, the hotline provides information and tips around the clock to assist bakers with some of the most common pie-baking challenges. Live pie experts can be reached Monday through Friday 9:00 a.m. to 7:00 p.m. ET. During the harried holiday season when pie baking is at its peak, live pie experts are on-call during extended hours, Monday through Friday 8:00 a.m. to 8:00 p.m. ET from November 18 – 27, and 8:00 a.m. to 7:00 p.m. ET from December 16 – 23. Additionally, recorded tips and tricks can be accessed 24 hours a day. ROLL dough (larger ball of dough for double crust pie) from center outward with steady pressure on a lightly floured work surface (or between two sheets of wax or parchment paper) into a circle 2-inches wider than pie plate for the bottom crust. Cut out pie crusts and transfer dough to mini pie plates. 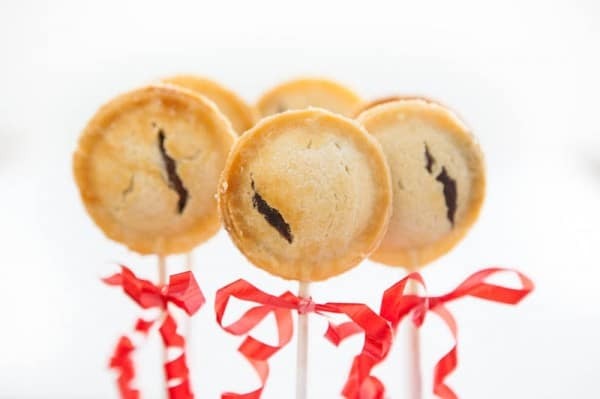 Make pie pops in a pie pop maker or in an oven preheated to 425°. Cut pie dough with a small cookie cutter. Fill with about 1/2 teaspoon brownie filling. Don't overfill. Add top pie crust and use a fork to seal pie dough. Either cook in pie pop maker or in a 425° oven for 10 - 15 minutes. These look amazing and are so cute! Perfect for Christmas party dessert! I adore these little cuties! These are adorable and what doesn’t taste good on a stick?! What a great idea using pie crust! I love these! This is an awesome idea! Who doesn’t want pie + brownies?? How fun are these?! I love brownies, and this is an even more fun way to have them! How brilliant are these?! And so perfect for the holidays!